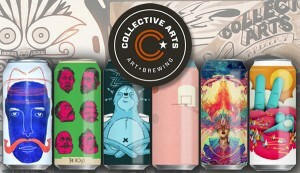 Stockbridge, MA, July 16, 2018 – Norman Rockwell Museum will host a special beer tasting with Collective Arts Brewing on Monday, August 6 from 5:30 to 7:30 p.m. Based in Ontario, Canada, Collective Arts Brewing commissions artists to adorn their cans and curates music to accompany each craft beer. There will be music, hors d’oeuvres and Collective Arts beverages served on the Museum Terrace. Bob Russell, the company’s co-founder, will be on hand to discuss the relationship between artists and advertising, and the work that has given their products a unique twist. Russell was inspired by Norman Rockwell’s illustrations in his formation of Collective Arts Brewing. The brewery aims to highlight the creativity of craft beer through the incorporation of original artwork that they receive from around the world. Expert curators put together a lineup of label art that successfully complements their latest craft beer collection, and the company also organizes recording sessions to bring music into the mix. The goal of the Collective Arts team is to promote emerging artists and musicians within the social environment constructed among beer drinkers. Admission to the event is $25, or $15 for Museum members. Please RSVP at rsvp@nrm.org or call 413.931.2265.